beautiful.ai is an incredible tool I can't recommend it highly enough. If you want to take your presentations to the next level and save hours and hours of time then this is the tool to use. You will not be disappointed. Saved huge amounts of time by using this tool instead of traditional powerpoint. I love the intuitive nature – you can easily design beautiful slides by choosing from their list of templates. Then – if you add an extra bullet point or take something away, it automatically adjusts the look of the slide to stay professional without any formatting! As an event organizer and speaker, I wish it was easier to export to PowerPoint and keynote as that is often required for various event speaking engagement. As a professional speaker, I spend a lot of my time designing slides. The goal is to convey important information, but also to make the slides engaging and visually interesting and using the beautiful.AI platform makes that very easy! "Transformed my ability to powerfully communicate insights and ideas"
Allowed me to save 10x time in design and produce a superior visual! I have 0 design background and the platform has helped me more powerfully illustrate and communicate my ideas in a significantly less amount of time spent on design. The templates are actually FUN to use and experiment with! What Presentation solution do you use? "Beautiful.AI is the best presentation tool I’ve ever found"
As a line of business manager and occasional conference speaker I've used every presentation tool out there. Powerpoint, Keynote, Slides.com/Slidesjs, Prezi, you name it. Beautiful.AI is the only one that's made me immediately productive and happy with the results every time. If you've ever found yourself endlessly tapping the right arrow key in Powerpoint to get two elements to line up, give Beautiful.AI a try. A few minor UX quibbles but overall it works exactly as I want it to. I am the type of presenter who always envies the people who can give impactful, elegant presentations when mine always look like a wall of text. Beautiful.AI is like a secret weapon. It makes me look like I know what I’m doing. 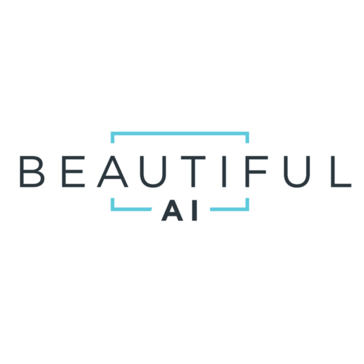 "I am reviewing beautiful AI"
I like the layout and formatting ease of use of the beta version,the webinars have been informative when trying to set my design Right on a project. The beta version is great,i would like to see more webinars and connect to peers or colleagues chat,also i would like to see more template and design options. Try it and utilize.the.features.and.webinars they are.helpful,be open.minded.with.your design and.layout,and ask questions if need.be.the support team. I have realized if i use a well organized data flow table that my colleagues and I'm can present the projects that are more complex in a technical aspect to an easy to understand presentation for the client,it would seem the more data and overhead needed the more template and design options increases ,however you want to keep a solid presentation,so each time could be more involved, less productive. "True game changer (after you learn all the quirks)"
It allows you to create professionally looking presentation in the matter of minutes. The missing tables are still a huge drag. Otherwise I wish the standard layout had just a little bit more flexibility. Just much faster and higher quality response to day-to-day presentation needs. "A game changer for professionals who aren't PowerPoint professionals"
I can make something professional looking without having to hire a designer. Took a while to add some much-needed functionalities (like fonts). Take the time to get to know the functionality; some of it seems counterintuitive at first, but once you have it down, it's a tremendous time saver. I didn't previously use decks when pitching business, because my PowerPoints were the presentation equivalent of a seven-year-old's handwriting. Now, I can tell a visual story. Very efficient and easy to use to make presentations come together, also entertaining and stress free to use. also love how there is no cost to keep using this software making it possible for anyone to use. has to be done on a computer, no offline app to use when you're on the go and need to make minor changes, also takes some time getting used to the tools. presentations are being done faster and more efficiently thanks to this software. not only is all the information all organized but presented beautifully as well, making the presentation enjoyable to view. "Beautiful.AI || Best presentation tool"
As a Business Analyst point of view.We have to give presentation day by day and this allows us to build professionally glance presentation in a very less amount of time.This is very productive and saves lot(s) of times.Always, give an strong impact to the customer after the presentation. Please give it a try you won't get(s) disappointed. If you have a time-limitation than its a great tool for the user. "Good visualization platform if you need a quick professionally looking slides"
I enjoy the ideas that this platform can quickly provide you according to your initial needs and requirements. Great platform if you are feeling lack of creativity in slides. I was making quick nice looking short slides on specific subject to support the main presentation. I love that this is sooo efficient and easy to use! I haven't found a dislike for this program ! I love that it provides the teams to work with each other so easily ! * We monitor all Beautiful.AI reviews to prevent fraudulent reviews and keep review quality high. We do not post reviews by company employees or direct competitors. Validated reviews require the user to submit a screenshot of the product containing their user ID, in order to verify a user is an actual user of the product.